Is your company looking for ways to cut costs, provide a comfortable and safe environment for warehouse employees, regulate temperatures or protect valuable products from the elements and other forms of contamination? Sounds like it would benefit from a strip door. Strip doors assist warehouse function and business owners in a variety of ways. Typically made from durable, PVC plastic, the tough strips provide a barrier between two spaces that are normally separated by a solid door. The difference is that unlike a door that is opened and closed to gain entrance or egress, the strip doors can be passed through via foot, vehicle or forklift. Even the highest quality rolling metal doors need a break once in a while since overuse causes wear and tear that leads to more frequent maintenance, repair and/or replacement. Also, any time wasted waiting for a door to go up or descend is time employees could use being more productive. Strip doors provide all of the same benefits of a closed steel door (sans off-hours security, of course), which makes them an ideal solution during working hours. Here are some of the benefits of installing strip doors in the right locations. Have a busy loading or shipping bay? Odds are employees prefer to have the door open at all times so they can keep working. This makes it impossible to maintain consistent – not to mention comfortable – interior temperatures, especially during the hottest and coldest times of year. Your PVC strip door will provide impressive insulation value, as well as protection from the elements. The strips part easily when people or vehicles pass through and then fall back into place, creating an insulating barrier between exterior and interior spaces. The result is less wear and tear on your HVAC system and higher annual energy savings. Just as people are susceptible to the elements, so are products, machinery and equipment. 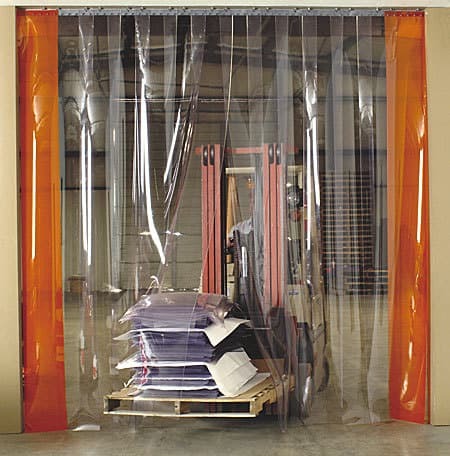 Strip doors make excellent barriers to improve quality control for your products. In cases where they’re installed between indoor and outdoor locations, strip doors provide improved regularity in regards to temperature, weather and humidity fluctuations. In interior locations, they can provide a more clean and sanitary environment for products that are particularly sensitive to dirt, dust or exposure to environmental particulate matter. Dealing with the cumbersome cooler and freezer room doors is difficult for employees in busy kitchens or food production and storage facilities. Yet, keeping a door propped open can raise temperatures to a level that compromises the inventory or violates food safety regulations. Strip doors are the answer. Simply choose a strip door model that provides the level of insulation you need and employees will notice a drastic difference. The good news about wide-span metal buildings is that production equipment and materials sizing is a non-issue. The bad part is that any building where design and manufacturing take place in the same area, or where office personnel need to do their jobs amidst noising construction, makes employees susceptible to noise volumes or odor levels that are intolerable. Strip doors are easy to clean and maintain, and will also save maintenance costs for the steel doors that take their place during the off hours. Contact R&S to learn more about strip doors and to choose the right version for your business’s needs. Previous Post: Solutions for Storing Holiday Decorations in the GarageNext Post: What Your Garage Door Says About You?